All You Need Is Drums That Help It All Come Together! 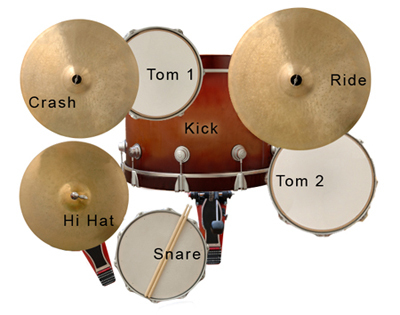 This product is a multi-sampled Ludwig® "Ringo-style" drum kit made to be played from Sonic Reality’s Infinite Player. It is a vintage 60's "Downbeat" kit with black oyster pearl and even had "The Beatles" logo on the bass drum head. 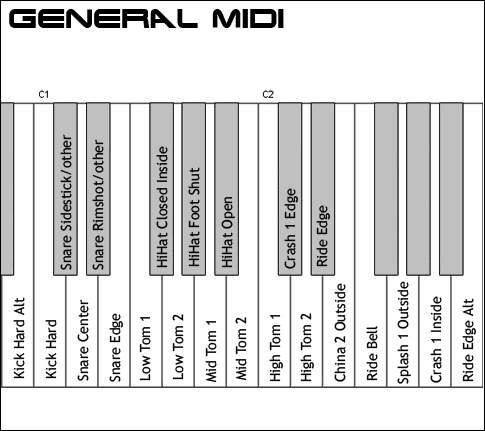 You get both snares on and snares off with this kit. It was recorded in a Nashville studio in a medium sized live room for flexibility to get a 60's dry drum sound or a more ambient rock sound all from the same kit. The sound of the kit is not muted (no tea towels used this time) so it is most similar to an early Beatle-esque sound with open sounding toms and snare. 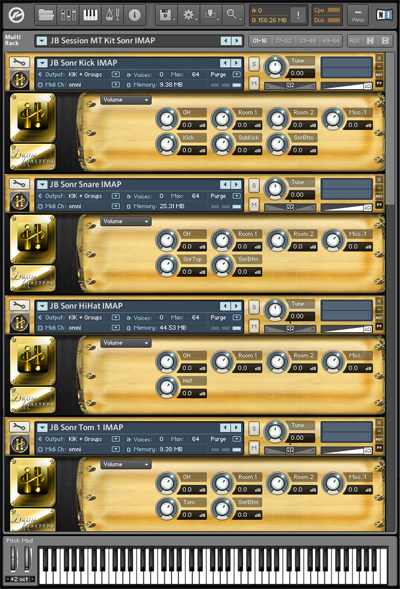 It is ideally suitable for getting a great multi-purpose retro 60's British Rock sound and works well with the RingBeat grooves played in the style of both early and later Beatles records. Quote from Dave Kerzner of Sonic Reality about RingBeats Kit: "I am a huge Beatles fan so when Mark Hornsby told me he could get hold of a classic Beatles kit I was excited about including it for what was, at that time, to be a "British Rock" bundle in the Studio ProFiles series. Since the time these "British Rock" kits/grooves were recorded in 2005 I have been researching Beatles sounds, visiting Abbey Road Studios, reading the incredible book "Recording The Beatles" and getting first-hand mentoring from Ken Scott who recorded many of the songs on "Magical Mystery Tour" and "The White Album". 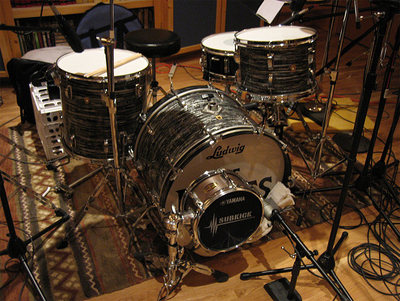 There are many different Beatle-esque drum sounds that we ve achieved over the years by using particular rare microphones such as AKG® D19's and D20's, Coles® Ribbon 4038 Mics and Neumann® KM56 as well as, of all things, tea towels on the top of the drums and a sweater in the bass drum! So, while this RingBeat kit is a nice first introduction to the wonderful sound of that classic Ludwig® Downbeat "Beatles" kit it is scratching the surface of what we ve captured since. Keep an eye out for a variety of different 60's Ludwig kits sampled and treated in unique ways in studios from LA to London. This RingBeat kit and forthcoming samples of similar Ludwig® kits make up an incredible luxury of options for one of the most desired and sought after vintage sounds in music production." Ludwig Kick Drum: 22" x 14"
Ludwig Jazz Festival Snare Drum: 14" x 5"
Ludwig 1 (2) Rack Tom(s): (10" x 8") & 13" x 9"
Ludwig 1 Floor Toms: 16" x 16"
Zildjian 2 Crash Cymbals 16" 18"
Kit Info: This is the drum kit that arguably shaped the future of drumming the most since the invention of the modern drum kit in 1909. 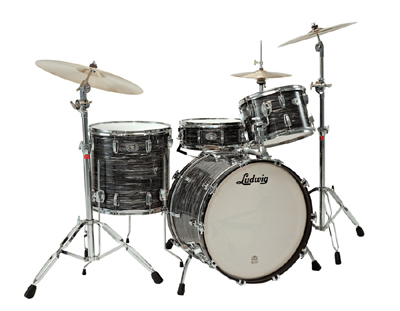 In the style of Ringo Starr of the Beatles, this recording of a Ludwig Liverpool 4 drum kit makes the world-famous Fab Four sound easily obtained via the Infinite Player!